A friend of mine gave me this recipe for homemade hot chocolate. This is THE BEST hot chocolate I've ever had, so of course I had to share it with our readers! This recipe makes 1 serving of hot chocolate, so make sure to double, triple, quadruple the recipe as needed! 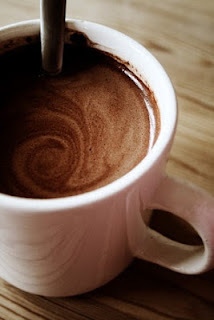 1 cup milk 1 Tbsp cocoa powder 2 Tbsp sugar a drop of vanilla a sprinkle of cinnamon Heat milk in saucepan. Add cocoa powder and sugar. Stir until well mixed, and add vanilla and cinnamon. Mix well. Serve. NOTE: Get creative! This time of year I like to add a sprinkle of Pumpkin Pie Spice to the mixture! You can add any kind of seasoning you would like. Maybe some mint extract? Orange extract? For my kids' winter class party, I did a hot chocolate bar. We added crushed peppermint baking chips, mini reese's pieces, crushed Heath bars, and other favorite mix-ins. We stirred it with a candy cane, and topped it off with whipped cream and sprinkles.